I've been very lucky this Christmas. Being a beauty obsessive, my lovely friends and family have gifted me with some gorgeous makeup related items. If you're reading this blog, you probably share my obsession so I thought you might like to take a look! 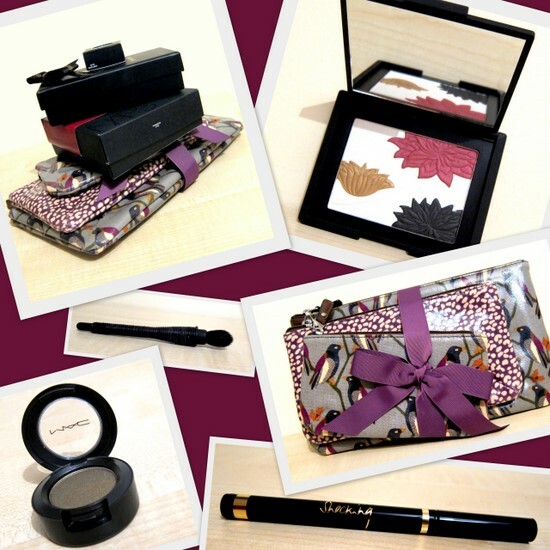 In the top right corner, that stunning floral palette is the NARS Hanamichi eyeshadow palette, part of the brand's Modern Kabuki Holiday 2011 collection. It comes with that lovely fluffy brush you see pictured. It's almost too pretty to use, but I'll manage! I also love this set of three make up bags from Fossil, in the Kilkenny Design Centre. That bird pattern is just adorable, and I'm always in need of storage solutions for my ever expanding collection! As a massive fan of eyeliner felt tip pens, I'm so excited about using this YSL Eyeliner Automatique Effet Faux Cils. Sali Hughes, beauty writer for The Guardian, tipped it as her number one pick in a recent column. And last but not least, I could not have been happier to open up my Kris Kindle gift this year (I do this annually with a group of friends) to find my favourite MAC eyeshadow, Sumptuous Olive. Gorgeous! Did Santa bring you any beauty booty this year? What was your favourite makeup or skincare related gift? Share it in the comments! I love the make up bags. They look lovely! I love the make up bags, so cute.